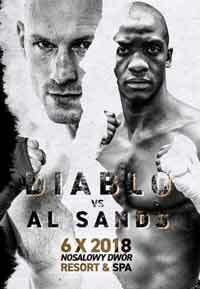 Review by AllTheBestFights.com: 2018-10-06, fight not so exciting between Krzysztof Wlodarczyk and Al Sands: it gets two stars. The former Ibf and Wbc Cw champion Krzysztof Wlodarczyk entered this fight with a pro boxing record of 55-4-1 (38 knockouts) and he is ranked as the No.17 cruiserweight in the world. ‘Diablo’ lost to Murat Gassiev in 2017 (Murat Gassiev vs Krzysztof Wlodarczyk) but then in 2018 he has won over Adam Gadajew (Krzysztof Wlodarczyk vs Adam Gadajew) and Olanrewaju Durodola (Krzysztof Wlodarczyk vs Olanrewaju Durodola). His opponent, Al Sands, has a record of 20-3-0 (18 KOs=90%) and he entered as the No.69 in the same weight class. He fought twice last year defeating Mengistu Zarzar and losing to Yury Kashinsky. Wlodarczyk vs Sands is the main event of the evening. Watch the video and rate this fight!